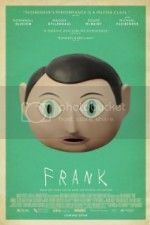 I just watched the Movie "Frank"
Frank is a 2014 comedy-drama film directed by Lenny Abrahamson and starring Michael Fassbender as the title character, along with Domhnall Gleeson, Maggie Gyllenhaal, and Scoot McNairy. The film premiered at the 2014 Sundance Film Festival. It was released theatrically in Ireland on 2 May 2014 and on DVD and On-Demand on 12 September 2014. It was released in cinemas in the United Kingdom on 9 May 2014. I watched Frank not that long ago. I would recommend it also even though it is a rather dull movie it has a poetic theme to it that is very amusing. I didn't find it "dull"
I liked the music... and I am not familiar with the musicians involved and that little part of music. Probably slow paced would be a better description than dull that is what I meant. I wasn't a fan of the music but I really enjoyed Frank's journey and the revelation of his reality. I liked that it wasn't forced and told its own story. I couldn't tell you the last new movie I've watched. Maybe Inception? Which I did enjoy.